NASA Hubble Space Telescope Imaging Spectrograph (STIS) views of the rapidly fading visible-light fireball from the most powerful cosmic explosion recorded to date. For a brief moment the light from the blast was equal to the radiance of 100 million billion stars. The initial explosion began as an intense burst of gamma-rays which happened on Jan. 23, 1999. The blast had already faded to one four-millionth of its original brightness when Hubble made observations on February 8 and 9. 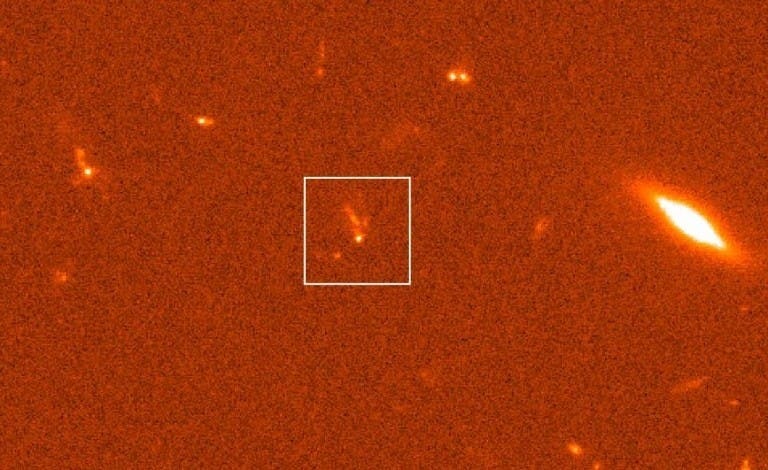 Space Telescope captured the fading fireball embedded in a galaxy located 2/3 of the way to the horizon of the observable universe. Space Telescope's observations further support the idea that these mysterious powerful explosions happen where vigorous star formation takes place. Gamma-ray bursts may be created by the mergers of a pair of neutron stars or black holes, or a hypernova, a theorized type of exceptionally violent exploding star. Gamma-ray bursts go off at about one per day. The armada of telescopes now looking for them is allowing astronomers to learn more details of the explosion to refine models for explaining these mysterious events.